Not surprisingly, the country that is home to the largest population of the region also has by far the largest area under cultivation. 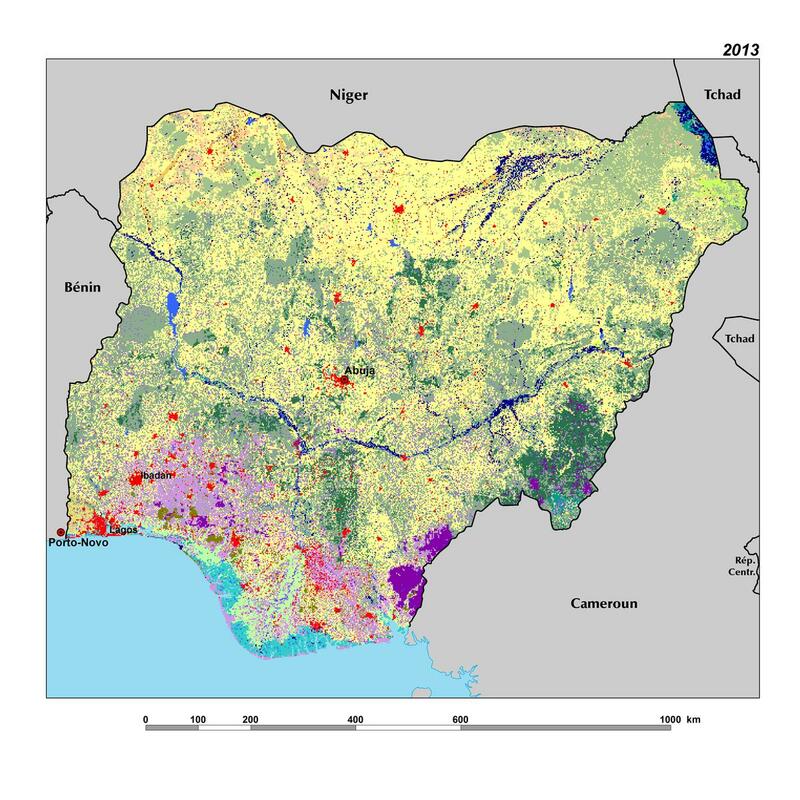 In 2013, rainfed agriculture accounted for 380,000 sq km in Nigeria, covering over 40 percent of its national territory, up from 20 percent in 1975. From 1975 to 2000, 130,000 sq km of new agricultural land were taken under the plough, with an additional 110,000 sq km from 2000 to 2013. The magnitude of these transitions — together exceeding the size of the entire country of Ghana— is unparalleled in the region. 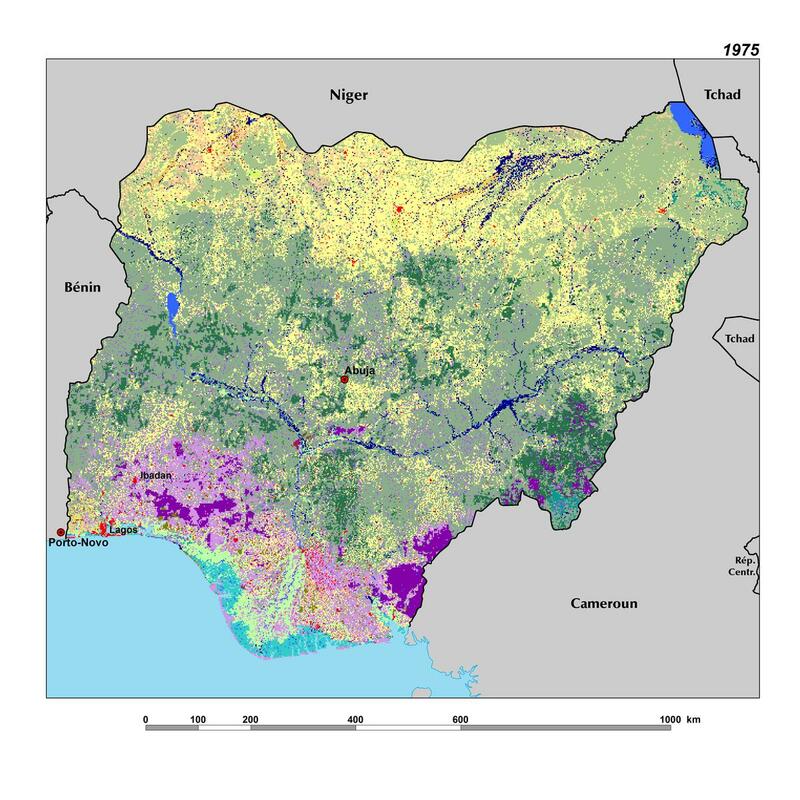 Nigeria is also the only country of the region in which agriculture has traded places with savanna, and doubled its area in 38 years, to make it the largest land cover type. The expansion of agriculture was observed across all ecoregions from the forest zone of southern Nigeria, where root and tree crops dominate, to the forest-savanna transition of the center of the country, where mainly root crops are found, to the grain belt of semiarid northern Nigeria. The Niger and Benue Basins, promoted as a prime agricultural development area and future bread basket since the 1970s, has seen the most prominent encroachment of agriculture into the savanna, sharpening the outlines of the remaining protected areas. Not all protected savanna areas, however, have been spared from the fast agricultural expansion. While the transition from savanna to agriculture constituted the largest land cover change in terms of area, some changes in the smaller land cover categories also stand out as important. High rates of change were observed for settlements, irrigated agriculture, plantation, and open mines, with gains accelerating from 1–2 percent per year between 1975– 2000 to 2–4 percent per year in the 2000–2013 period. Under the pressures of a rapidly growing population and economy, forests, gallery forests and woodlands, in addition to the savanna land cover types, were all being diminished, with loss rates increasing to over 2 percent per year during the 2000–2013 period. Forest area decreased by 45 percent from 1975 to 2013. While the area of mangroves and swamp forests along the coast and in particular in the Niger Delta — important hotspots of biodiversity — has decreased less than that of some other land cover types, the health of these ecosystems has been severely damaged by recurrent oil spills caused by accidents, poor maintenance, and sabotage of the large-scale oil extraction infrastructure in the Delta. Environmental regulations are weak and rarely enforced, and there are no effectively protected areas in the Delta, whose forest and animal populations are considered under severe threat (World Wildlife Fund, 2016).